When a guy becomes a Member of Parliament there are some things he just can’t give up. For Masterton-based Labour Government List MP Keiran McAnulty that something is his role as MC at one of the biggest events in his region – the Golden Shears. Back in Masterton’s War Memorial Stadium, where he became MC five years ago, after a two-year “apprenticeship” with predecessor and the now-late Craig Cooper, Mr McAnulty said that like many in Masterton, his association with the “Shears” goes back to school days, as a pupil at St Patrick’s School on a school visit being shown the sheep and the shearing. School groups have been regular school day visitors to the Masterton War Memorial Stadium ever since the Golden Shears were first held in 1961, in a stadium that was really designed for more regular indoor sports such as basketball. Sitting in the stadium with Golden Shears life member and former longtime timekeeper Bruce Arcus, Mr McAnulty said that while the event had interested him ever since those schooldays, it was after he came home from the big OE in Ireland he appreciated its real significance, and he’d been a regular at the Shears ever since. Trained in accountancy, it was when he began working for the TAB that he got to take that interest to another level, running the fixed-odds shearing betting, which had been a unique feature of the TAB programme for more than a decade. Living in Masterton and commuting to Wellington he soon found himself embroiled almost irreversibly in the Golden Shears structure, firstly as a committee member, and then as the man at the microphone heading-up the more than 20 prizegiving ceremonies at each year’s event. It’s a voluntary and unpaid role, and always will be, he said. 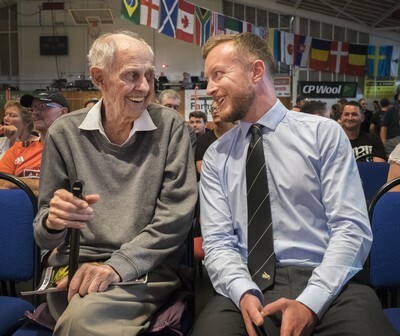 Mr McAnulty, who was unable to be in Masterton for the opening day of the 58th Golden Shears on Monday, because of events in “the House” over the hill in Wellington, says Mr Arcus is a tyical example of the many who have volunteer service to the Golden Shears stretching many decades. Mr Arcus, now in the mid-80s, was a farmer when the first Shears were held, and when he came into town to support his shearers. So he has been, another 55 times, missing just twice, both times because he was in hospital. Made a life member in 1985 and now retired in Masterton, he was at the Shears again yesterday from the start. “I was here,” replies Mr Arcus. “Where the hell else would I be? VOLUNTEERS: The Golden Shears voluntary MC, new Member of Parliament Keiran McAnulty(right), and one of the event’s longest servants, Bruce Arcus.